The subspecies differ only slightly in size and plumage tone, with the exception of A. h. occidentalis, native to South Florida, which also has a distinct white morph, known as the great white heron (not to be confused with the great egret, for which "great white heron" was once a common name). The great white heron differs from other great blues in bill morphology, head plume length, and in having a total lack of pigment in its plumage. It averages somewhat larger than the sympatric race A. h. wardi and may be the largest race in the species. In a survey of A. h. occidentalis in Florida, males were found to average 3.02 kg (6.7 lb) and females average 2.57 kg (5.7 lb), with a range for both sexes of 2 to 3.39 kg (4.4 to 7.5 lb). This is mainly found near salt water, and was long thought to be a separate species. Birds intermediate between the normal morph and the white morph are known as Würdemann's heron; these birds resemble a "normal" great blue with a white head. ^ a b c "Great White Heron". fws.gov. U.S. Fish & Wildlife Service. Retrieved 6 September 2018. ^ a b Sibley, David Allen (5 November 2007). ""Great White" Heron – not just a color morph". Sibley Guides. Retrieved 6 September 2018. 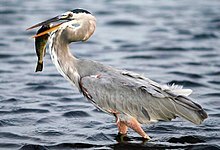 ^ "Hinterland Who's Who – Great Blue Heron". Canadian Wildlife Service. Retrieved 23 November 2007. ^ Creditor, Avi (5 September 2018). "David Beckham's MLS Expansion Team Has a Name: Inter Miami CF". Planet Futbol. Sports Illustrated. Retrieved 19 September 2018.